You don't need to look further than the current presidential campaign to glean that the American dream isn't doing so hot right now. Hillary Clinton has proclaimed that "building an economy that works for everyone, not just those at the top, is the central challenge of our time." Donald Trump's view is a bit more blunt. "Our country is going to hell," he said earlier this year. "We're becoming a third-world county." So, yes, the state of the American dream is a touchy issue. And while politicians running for the Oval Office obviously have to take on middle- and working-class angst, brands might prefer to steer clear of something so contentious and polarizing. Ikea, however, is not among those brands. 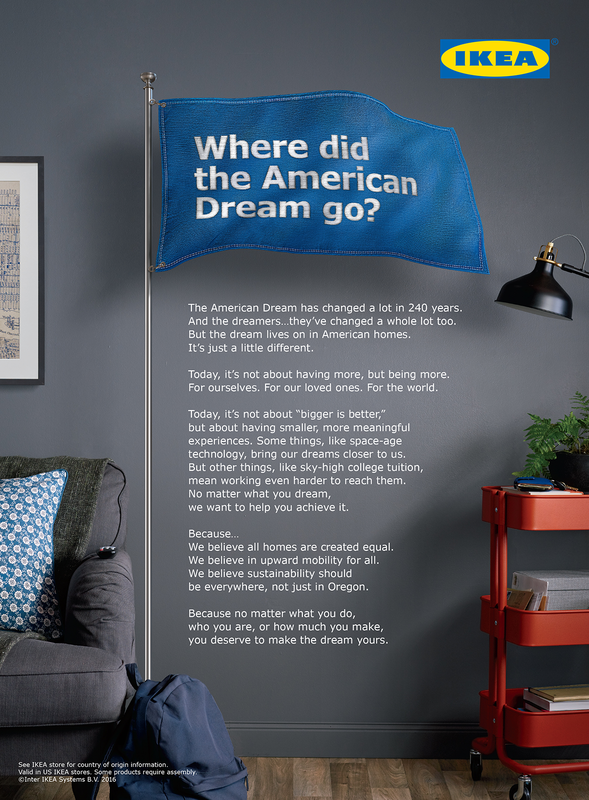 In its latest marketing effort, the home-furnishings giant goes right to the heart of a difficult topic, asking, "Where did the American dream go?" As it turns out—according to related research Ikea conducted in partnership with the Economist Intelligence Unit—the dream hasn't gone far, though it has changed significantly. "One of the things we've seen since [the recession of] 2008 is a change in people's perception of what it means to make it in today's society," said Christine Whitehawk, Ikea U.S.'s communications manager. "So you see a shift happening." That shift, according to Ikea, means consumers are measuring the American dream less in terms of material accumulation—the suburban McMansion with a new SUV in the driveway—and more in terms of making the most of what they have, living life on their own terms, and focusing on creating memories instead of just accumulating more things. In other words, a megaretailer built on selling a lot of stuff to a lot of people has formally declared that people matter more than stuff. And while its new 30-second spot—which debuts today—still contains the clever humor and stylish interiors that are hallmarks of Ikea's branding, there's also a palpable shift toward populism. "At Ikea, we believe that everything from your lamp to your couch should work as hard as you do," the narrator intones, going on to say that "green living" should be "something everyone can afford." The characters in the spot are not young urban hipsters, but pleasant if harried folks in middle age, working hard to get dinner ready and the baby off to bed. Ikea could have easily drawn these common-folk themes from what's in the news every day, but Whitehawk said it was important to base its messaging on proprietary research that would add authority and authenticity. Among the findings of the brand's report, titled "Discovering the New American Dream," is that 60 percent of people now believe that the American dream has "more to do with achieving satisfactory quality of life defined in ways other than obtaining material possessions." While 45 percent of people still believe the American dream means buying a home, for example, a much bigger number, 57 percent, believe the dream is lived "though everyday moments with friends and family." "The idea of asking where did the American dream go was not to show that it went away," explained Leslie Stone, director of strategic services for Ogilvy, the shop behind the creative work, "but that people are living it every day in diverse ways." "There are so many different ways that Americans live—multigenerational, gay parents, etc.—that define the real portrait of the America that's really out there," Stone said. "If we'd put across 20 different living situations, they'd all be equally powerful." The new creative is the opening salvo in a year's worth of creative under the slogan "We Help You Make It," all of it intended to teach consumers that, whatever their definition of the American dream might be, Ikea can help with it. Whitehawk added that Ikea's new creative work is also an attempt to make the brand more accessible as it branches out from core markets where Ikea is already familiar into regions—many of them populated with Americans struggling to stay in the middle class—where consumers might not understand the brand as well. "People are finding it harder to make it in today's society, but the optimism is still there," Whitehawk said. "We're trying to get the message out that we're here to partner with them to create that everyday better life that they want to have."